South Beach Bail Bonds, South Beach Bondsman, Bonding Agency. Bail Yes.com is serving the city of Miami Beach and South Beach, Florida for bail bonds 24 hours 7 days. To speak now to a licensed bail bondsman call our number 1.800.224.5937 or 305-860-1001. Pay South Beach bail bond with credit card by phone. Call 1-305-860-1001 for local South Beach bail bonds agent. Open 24/7. @ Bail Yes.com web pages we provide you with Miami South Beach bail bond information, online search to local jails inmate information, courts, sheriff’s offices, South Beach criminal defense attorneys, South Beach bail bondsman. 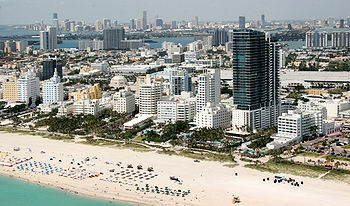 South Beach is a 20+ block area of Miami Beach, Florida that encompasses the southernmost tip of the island. South Beach is known the world over for its beautiful beaches, dinning and nightlife. It is a favorite tourist gathering, with fine restaurants and café’s lining Ocean Drive on South Beach. Club goers can find plenty of dancing and watering holes along South Beach’s Washington Avenue, 5th Street, Alton Road, Collins Avenue, club districts. The Miami Beach Police department’s South beach station and jail is located at 1100 Washington Avenue, South Beach. When you are arrested on South Beach you will most likely first go to the Washington Street Miami Beach Police station. You will be held there waiting for transportation to the mainland, where you will be booked into the Miami-Dade County Jail Pre-trial Detention Center located at 1321 NW 13 Street in Miami. The booking process usually takes about 4 hours. Only after the defendant is booked at the jail can bail be posted, once bail is paid either in cash or with a bail bond the defendant will be released within a few hours. Keep in mind that the release process will take longer depending on how busy the jail is. If someone you know was arrested on South Beach and you would like to arrange his or her release or you just want bail and charges information please call and speak to one of our bail agents who can quickly help you. Pay by phone, with a credit card. A Miami beach bail bond company, agency in South beach with bondsmen on call 24 hours, 7 days a week.